Does My Small Business Need to Act Like Big Brother? Whether you like it or not, Big Brother is here. Video surveillance systems are everywhere. However, does adding a video surveillance system to your small business make sense? Does your business need to be acting like Big Brother? While it’s important not to toss aside privacy issues, in order to know your small businesses is protected, it’s also important to know what’s happening at your office, store, or other asset using surveillance cameras. No small business can place security guards everywhere. But, what they can do is install outdoor security cameras. This helps fewer security guards cover a larger area. The best security system can also be used to collect evidence. Someone might have set their laptop down at a workstation; when they returned, it was gone. With security cameras, you can recreate the event to find the guilty culprit. A wireless camera can help improve productivity. Managers don’t need to stand over their workers, ensuring that they are keeping busy. You can properly analyze workflow, gather statistics and improve processes. This will allow you to do more, while spending less money. You don’t need to hire as many workers because each will have higher productivity rates. You can increase quantity and improve quality, which will increase revenue. The best camera system can protect your valuable supplies, reducing the amount of money you spend to maintain inventory. Employee theft is a tough issue to face, but it is a reality. Expensive laptops, tablets, smartphones and other equipment can be very enticing to the common thief. It can be very uncomfortable to accuse any employee of theft. Before you do it, you better be sure with plenty of proof. And, that is what a high-quality camera can give you. There might be other things that are occurring at your workplace, during the off hours when you are not there. Get a better grip on your business with well-placed cameras. Video surveillance security can prevent racial or sexual harassment before it happens. Many incidents start out as “he said, she said.” You must get a better understanding of what actually happened. Problem employees will know that you have a camera watching their every move. This can help you maintain a healthy work environment and prevent expensive lawsuits. Avoid “ruffling feathers” by being proactive. Few small business owners truly want to become Big Brother, but doesn’t it seem like the world is heading in that direction? You can justify surveillance for security, safety and productivity reasons. It all depends on how you set up your video surveillance. 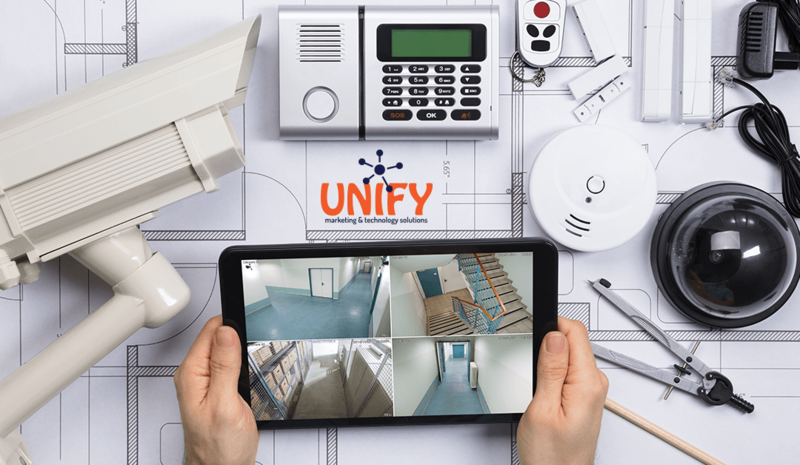 If you are looking for a video surveillance system, we, at UNIFY marketing & technology solutions can help. Call us at (419) 740-1010 schedule coffee with us to discuss your all of your technology needs.